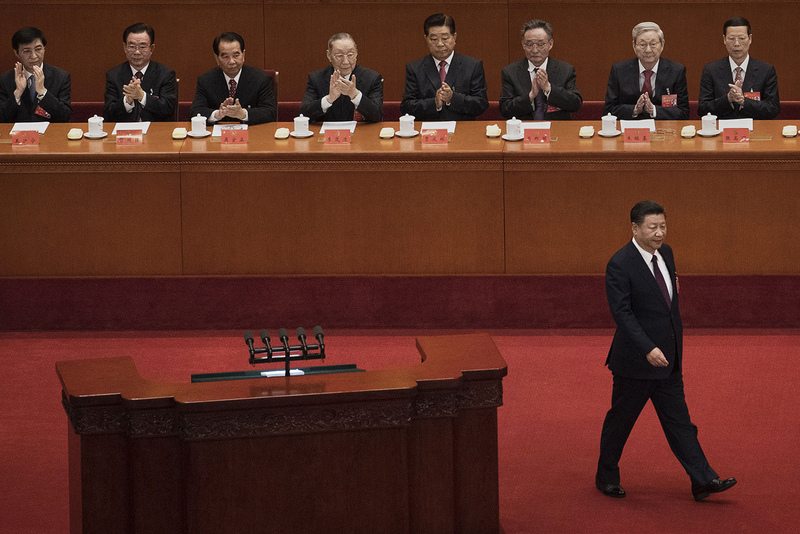 President Xi Jinping walks across the stage at the opening session of the 19th Communist Party Congress held at The Great Hall Of The People in Beijing, October 18, 2017. To me, the most surprising and interesting part of the new Politburo Standing Committee (P.B.S.C.) lineup is the absence of Liu Qibao, head of the Party’s propaganda apparatus. Before today, I would have posited that the very nature of the Chinese Communist Party, especially given its reinvigorated focus on message control and creation, dictated that a veteran of the Propaganda Department would find a seat at the head table. What does Liu’s absence say about the Chinese Communist Party’s (C.C.P.’s) attitude toward propaganda, especially if Wang Huning takes up the propaganda portfolio? Liu might have been left off for political reasons, into which I cannot claim any insight. But if his absence is the result of policy designs, one could posit that the elevation of Wang Huning actually signals an even more strategic, long-term approach to propaganda concerns. Rather than approaching censorship and spin from a more day-to-day managerial perspective, as a long-serving propaganda bureaucrat might, Wang spent more than 20 years at the Central Committee’s Policy Research Office, presumably thinking big thoughts about what C.C.P. governance means in a post-revolution—and indeed post-communist—era. Wang’s constant presence over the last three administrations hints at the importance of his ideas. He may be a savvy choice as master craftsman of an all-important narrative about the fundamental meaning of China and the Chinese Communist Party (necessarily intertwined) in the 21st century. Because of Wang’s prior position as a political scientist at Fudan University, we now have an unusual, if dated, window into one of the top Chinese leader’s thoughts on governance. As Jude Blanchette perceptively noted last week, “if we want to understand we the ultra-conservative political moment China is now in, we need to understand Wang Huning’s theory of ‘neo-authoritarianism,’ which he helped develop in the years before his disappearance into the Party.” I do not know if the theory outlined above is indeed the strategy behind Wang’s elevation and Liu’s absence—and of course, there is the issue that Wang Huning’s age and career path bucks previous expectations of who would ascend to the P.B.S.C., which is another interesting aspect to this particular personnel shuffle. Whatever the motivations, we have a unique opportunity to better understand one of the men at the apex of the Chinese political system. Politics rules the day. The 19th Party Congress shows the so-called succession rules are as political as anything else. Yes, Xi did preserve the rules of no one age 68 or above and no military. He also kept the tradition of no women in the Politburo Standing Committee for the next ten years; Sun Chunlan will not be promoted at the 20th Party Congress when she will be 72 years old. The lineup, however, makes the succession in five years murky at best—in pure seniority terms, Premier Li Keqiang should become Party General Secretary—unless Xi intends to stay on. Politburo member Li Yuanchao is out, presumably on his way to a corruption investigation and dismissal from the Party like a number of his proteges out in the provinces. Zhang Chunxian and Propaganda Chief Liu Qibao were demoted from the Politburo, but remain on the Central Committee. Xi’s right-hand man, Li Zhanshu, jumped several other leaders to become the third-ranking standing committee member and, presumably, National People’s Congress Chairman. Wang Huning arrived at the top without punching his ticket as a provincial or ministerial leader. Yang Xiaodu helicoptered to the Politburo and secretariat without so much as an alternate Central Committee membership. These may appear to be a few nips here and a few tucks there, but that is how politicking works. Jiang Zemin removed Li Ruihuan and expanded the standing committee for two of his lackeys in 2002. The age limit changed again in 2007 to remove Zeng Qinghong. The standing committee shrunk from nine to seven members in 2012, keeping Hu Jintao’s proteges Wang Yang and Li Yuanchao off of it. Corporate boards expand and contract for similar reasons. In large organizations, personnel appointments at the highest levels always are political if for no other reason than the number of potential candidates exceeds the open positions. Why should we expect the 89+ million member Chinese Communist Party to be different? We will, under the Party’s leadership, carry out extensive consultations on major issues relating to economic and social development as well as specific problems involving the people’s immediate interests, and conduct consultations before and during the implementation of policy decisions. We will build a consultative democracy featuring appropriate procedures and complete segments to expand the consultation channels of the organs of state power, committees of the Chinese People’s Political Consultative Conference, political parties, and community-level and social organizations. We will conduct intensive consultations on issues relating to legislation, administration, democracy, political participation and social problems. The section on “innovations in social governance” called for clarifying the rights and interests of social organizations and working with them to create mechanisms to prevent and resolve social conflicts. The language here was still state-centered, emphasizing the role of Party leadership and adhering to the law, but the call for reinvigorating horizontal interactions between the state and society, rather than strengthening the state’s vertical management of society, was notable, unprecedented, and, yes, even innovative. Four years after the Third Plenum Decision, it is clear that Xi has turned his back on his own prescription for better governance, and instead condoned tightening controls over social actors, and silencing those who advocate for socioeconomic changes. There have been a few exceptions. The revised Environmental Protection Law, which went into effect on January 1, 2015, allowed social organizations for the first time to file public interest lawsuits against polluters. In November 2015, facing historically high levels of labor disputes and strikes, Xi also took the official trade union, the All-China Federation of Trade Unions (ACFTU), to task for becoming irrelevant to workers and called on them to reform to better represent workers. But these measures have been too few and more symbolic than substantive. The tragedy of these last few years is that the voices that have been muzzled were not calling for revolution, instigating violence, or fomenting social disorder. They were instead constructive voices calling for practical, innovative ways to address official corruption, unpaid wages and social insurance, sexual harassment, pollution, and discrimination against ethnic minorities. The people calling for these changes were doing so out of a sense of responsibility to the nation, because they wanted to make China a more inclusive, equitable, and just place very much in the socialist spirit. They were in fact the very voices that could help Xi craft better policies if he had listened to them and incorporated their ideas into his policies. The challenges Xi and his new leadership team face after the 19th Party Congress are immense as Xi himself acknowledges. If he continues his current governance approach, he runs the very substantial risk of undermining the long-term capacity of the Party to govern by vesting so much power and authority in himself. Or he could use his immense power wisely and return to his original playbook of social governance, reaching out to social constituencies to give them a voice in shaping socioeconomic policies, thereby creating broad-based support that would strengthen their legitimacy and sustainability. A version of this post was first published on the NGOs in China blog. President Xi Jinping appears to have consolidated power successfully, leading China boldly forward in a new era and placing China at “the center of the world stage.” The internal power struggles and negotiations leading up to the 19th Party Congress cannot come cost-free. Certainly, among the targeted tigers and flies, there must now lie future enemies. “Xi Jinping Thought on Socialism with Chinese Characteristics for a New Era” puts forth a comprehensive policy billed to realize the China Dream of national rejuvenation through its “14 Upholds.” These 14 points can be organized loosely into three categories: development, security, and law. First, despite the invocation of a people-centered approach to development, citizens have no meaningful voice to fully participate in policy decisions that affect them. In recent U.N. sessions, China has made clear its rejection of a rights-based framework that is critical to sustainable and equitable development. In China’s “new era,” the political elite control the dreams and aspirations of over 1.3 billion people. China’s development plan will have regional and global effects as well. Official assurances by Xinhua News Agency that China will “never seek hegemony or engage in expansion” are unconvincing in the face of China’s One Belt, One Road initiative, through which billions of dollars in direct investment, infrastructure, and loans tie over 60 countries to China, including those willing to mortgage their futures to a China-dominated world. Second, China’s “holistic security” approach is an expansion of existing securitization policies backed by Chinese law, security apparatus, and China’s military power. The approach is aimed at comprehensive social control, including through ideological propaganda to ensure complete loyalty to the Party from the media, educators, lawyers, and the general population. Over the past several years, China has also expanded regulatory control over cyberspace, religion and cultural practices of ethnic groups, and foreign NGOs, all in the name of national security. The criminal prosecutions of peaceful expression give teeth to these laws, which punish any voice that refuses to be “harmonized.” Even peaceful expression of alternative visions—for example, Liu Xiaobo and Charter ’08—come at great risk and human costs. Third, the Party’s stated goal to govern the country by law is no longer masked by past translation slippages with “rule of law” or “rule by law.” The concept of “rule of law” is at the heart of the international human rights system and its core pillars include transparent and accessible laws, an independent judicial system, and elements of due process and fairness. But if the Party demands the complete loyalty of judges, lawyers, and prosecutors, then to govern the country by law is mere governing through authoritarian rule. Consolidating power is not the same as maintaining it. Xi and the Party must address the real problems facing Chinese people. The tried and failed method of the Chinese Communist Party—control, censorship, and propaganda—will not work in the short or long term, even if labeled and welcome as new. An earlier version of this post first appeared in the Hong Kong Free Press. The message from the Communist Congress which finished in Beijing last week was clear—the Party rules supreme. It always was, of course, but its role has now been underlined both as an institution and by its personalization through the leader as Xi Jinping and the Party are intimately identified. As he seeks to occupy an ideological high-ground with Chinese characteristics and bring together past, present, and future, his supremacy is the logical outcome of five years of power concentration and consolidation that brings to mind the imperial dynastic ethos. Socialist Modernization is the new Mandate of Heaven, and any deviation from imperial doctrine is treason. This re-opens all the questions that hang from one-man rule which Deng Xiaoping recognized and tried to remedy. But the Congress made clear that no force exists in today’s China willing, or able, to counter-act the personification of Party rule. Given the continuing growth rate and the international vacuums Trump has opened up for the People’s Republic, one might ask why anybody should mobilize against Xi. Five years on from his first coronation, turning back the clock towards a devolution of political, economic, and social control would require an anti-Xi whose mission might be rendered impossible by its ultimate goal. It is hard to be strong man in an authoritarian system who seeks to delegate power as Deng found in 1989. So what China is in for is an accentuation of what it has seen since the end of 2012. The bird cage of conservatives in the 1980s will be reinforced. Market mechanisms may be used, but only to serve its bottom line of state power consolidation—and what is given can always be taken away. The logic of power as defined by the leadership will rule. There will be room for private-sector firms so long as they operate within the bounds set by the Party. Foreigners will be allowed to operate so long as they bring technological goodies China wants. It is not as if there is any subterfuge in this. From the start, Xi’s overall aim and modus operandi has been quite clear; no closet reformer, he. Obedience will be required to whatever the leadership decides is the correct policy at any given moment as it evolves a new growth paradigm and the economic management system based on the Party State. There is likely to be a greater accent on social issues including reducing wealth disparities, helping depressed regions, cleaning up the environment, and developing urban infrastructure to make cities more livable. But the basic aim of retaining political stability and dominance will not alter, and the Congress showed the extent to which the world has to frame policy with a better understanding of that as Xi seeks to pilot China to the center of the global stage while further building up the dominance of the Party-state at home.